Do you like to read about science? Does the fact that Argentina is named for a singular chemical element intrigue you? Do you want to know on which famous boulevard the first neon light shone brightly? Do you want to know more about the Swedish island of Ytterby, home to a mine that would prove to be the original source for no less than seven new chemical elements? If your answer to any of these questions is yes, I’ve got a great book for you. 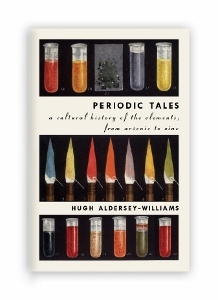 Periodic Tales, by Hugh Aldersey-Williams is jammed full of countless stories about the different chemical elements around us. Starting with gold, the most coveted of all the elements, the book includes forty chapters, each one covering a wide array of topics related to a single element, or occasionally a group. He typically includes some information about its discovery and its relationship to other elements, but his primary focus is the cultural aspect – what was the substance used for, how did it impact society, how have these uses and impacts changed over time. He discusses how radioactive radium was initially used as a healing substance in the baths at The Radium Palace Hotel in what is now the Czech Republic. He explores how the greenish glow of the first sodium street lights impacted art and literature and how many other compounds were used to create the fabulous colors in fireworks. He also reveals that Napoleon may have died of arsenic poisoning, not due to foul play, but possibly due to the arsenic based green wallpaper pigments that decorated his prison on St. Helena. Page after page delivers similar stories and trivia that kept this science geek thoroughly entertained. A British writer who’s written on many topics, Aldersey-Williams has always been fascinated by the elements and has been striving to collect a sample of each of them since childhood. Here and there in the book he describes some of his recent efforts to add to his collection, toxic fumes and gamma rays be damned. Throughout the book, the author refers to the periodic table surprisingly infrequently and most of the underlying chemical details are glossed over. There isn’t even a copy of the table in the book, although it doesn’t hurt to have one handy from time to time. For this reason, it’s entirely possible that people who don’t like chemistry or hated it in high school might still enjoy this volume. The book is tied together by the idea that every material object that people encounter in their daily lives is made up of a limited number of chemical elements in countless forms. Based on this concept, there really are an infinite number of things the author could write about and while he does go on for 400 pages, he pares the list down enough to keep things interesting. Given that each of the chapters stands well on its own, I actually read the book over a few months, taking breaks to read other things. Periodic Tales is an entertaining and amazingly wide ranging exploration of the elements that make up everything in our lives. From the calcium in sidewalk chalk to the phosphorous in the glow of a firefly, from the antimony in Jezebel’s mascara to the chromium in a glowing red ruby, there are countless tales to be told about the elements. This book is an impressive collection of many of them.